To get from Stockholm, Sweden, to Helsinki, Finland, and back, travelers have limited transportation options due to geography—the cities are separated by the Baltic Sea. Each travel method between the two cities has pros and cons, but in general, flying is the easiest and fastest option. Nonstop flights between Stockholm and Helsinki are operated by Scandinavian Airlines (SAS), Norwegian Air, and Finnair. The flights depart several times a day and only take an hour. When booking your flights, check different airports to see which is cheapest. While Helsinki only has one airport, Stockholm has four, two of which have direct flights to Helsinki: Arlanda (ARN) is the major international airport, and Bromma (BMA) is a regional airport. Traveling between the cities by air is quick and easy, and actually can be pretty affordable: you usually can find round-trip flights for about $100 and one-way flights for about $50. Book flights at least three weeks in advance for the best deals. If you have some time to spare while traveling, there's a 16-hour ferry connection between Stockholm and Helsinki leaving in the afternoon and arriving the following morning. The Viking Line and the Tallink Silja Line ferries both cover the Stockholm to Helsinki route and the Helsinki to Stockholm route, as does the once-a-week St. Peter Line. The ferries include onboard services such as bars, restaurants, different types of cabins, and duty-free shopping. You can travel as a foot passenger, but you can also bring cars, motorbikes, and bicycles on the ferries. The Viking Line offers cheaper cruise prices but uses older ships; Tallink Siljah Line cruises are more expensive but also offer more elegance. Booking a weeknight cruise from Stockholm to Helsinki is cheapest, and there's another discount if you buy a round-trip ticket. One-way weeknight tickets for cabins start at around $110 on Viking and $150 on Tallink Siljah Line, but prices vary depending on season and on which cabin category you choose. You can also take a ferry from Stockholm to Åbo, Finland, which takes 10.5 hours, and make your way south to Helsinki from there by bus or car. While taking the ferry is a leisurely and fun way to travel between Stockholm and Helsinki, it's not necessarily cheaper than flying, and it's certainly a lot slower. Many travelers who choose the ferry opt to do so for the experience. Though Helsinki and Stockholm are only about 250 miles apart as the crow flies, they're separated by water. 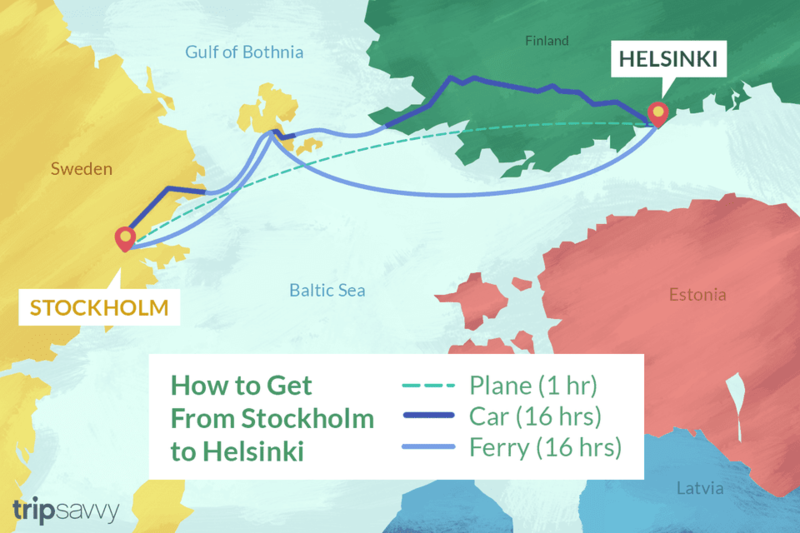 You'd have to drive all the way around the Gulf of Bothnia in order to get between the two cities—it's roughly a 1,000-mile journey, and it'll take about 20 hours if you don't stop. It's only a few hours faster to take your car onto one of the ferries, but you'll be able to relax on board since you don't have to drive! There are no train or bus connections between Stockholm and Helsinki.